Yooshin Kennels is a small-scale hobby kennel located in southern California. The primary goal of this kennel is the education and/or the exhibition of the Korean Jindo within the English-speaking dog fancy. Occasional litters of Jindos may be produced. Yooshin Kennels is managed by Ann Kim, who is a "1.5" generation Korean-American. She obtained her Bachelor of Science in Chemistry at the University of California-Berkeley and her Master of Science in Molecular and Cellular Biology at Arizona State University. Though not her field of study or career path, she is familiar with the issues of canine genetics and population genetics. Ann was introduced to her first Jindo through her father who had owned them when he lived in Korea in the 1960's. The raising of the Jindo dog was a family affair then as it is now. After the family immigrated in the 1970's, they did not have Jindos until the 1990's. 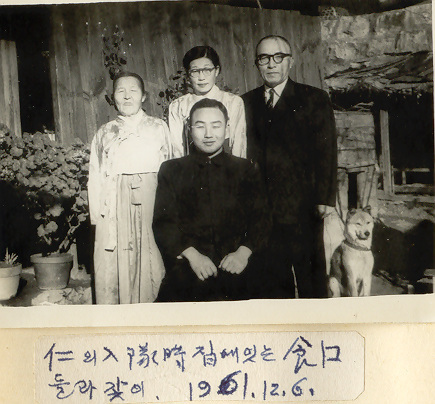 Great-grandmother, grandmother, grandfather, and uncle posing with the family Jindo. Ann has been involved with the Jindo community in the United States since 1996 and casually involved with the Los Angeles Jindo clubs since 2000. Her male dog, HwangJae, was the first Korean Jindo to earn both the American Temperament Testing Society certificate and American Kennel Club -Canine Good Citizen certificate. Ann wrote a comprehensive website in the late 1990's about the Jindo after reading and disagreeing with errant English information about the Jindo on the web and in books. Her material is now located at www.jindos.com. In July 2016, Ann was designated as the AKC-FSS contact for the Jindo. Yooshin Kennels was formed after the acquisition of PoongSoon the Poongsan in 2011 and HoSu the Jindo in 2012. In 2019, Yooshin Kennels officially narrowed their focus to just the Jindo breed.